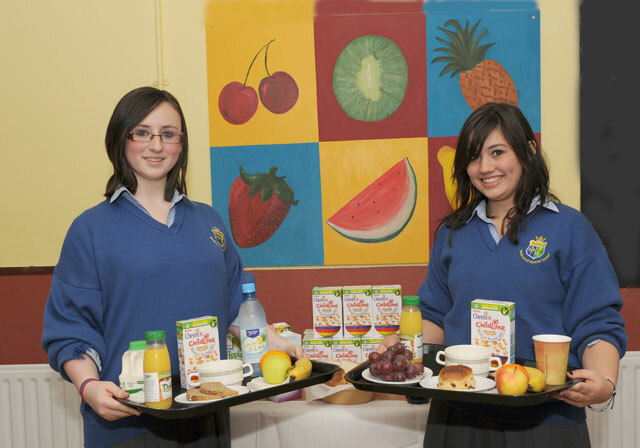 Transition Year students of St. Joseph’s Secondary School, Castlebar organised a breakfast in aid of Childline as part of the "Cheerios Childline Breakfast Together" fundraising appeal, which ran from 5 October to 11 October. Due to lack of funding, Childline was only able to answer 60% of children’s calls last year. This fact left the girls reeling in shock and as a result students from TY(3) decided to take action by organising breakfast mornings for the students of our school. The Breakfast Mornings were a huge success and were enjoyed by all. All the money raised went directly to Childline. Transition Year students of St. Joseph’s Secondary School, Castlebar organised a Breakfast in aid of Childline as part of the “Cheerios Childline Breakfast Together” fundraising appeal, which ran from 5th October to 11th October. Back Row: Left to Right Karen Kavanagh, Laura Walsh, Kate Armstrong, Laura O’Donnell, Orla Carney, Denise Mangan, Michelle Grealis, Amie Staunton, Maria Walsh, Michaela Gavin. Ms. Lydon. Front Row: Left to Right Laura Nugent, Emma Redmond, Emma Daly, Dearbhla Gibbons, Alice Corley, Aisling Towey, Sarah McNicholas. Photo Tom Campbell . We would particularly like to thank local businesses who kindly donated breakfast supplies for the event. This event has heightened awareness among the students of the plight of children with problems and the great work Childline does.